Adds a new record to the end of dbf file. 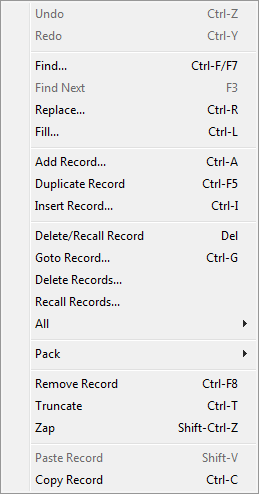 Inserts a new record to dbf file before the current record. Displays find dialog (Query by example) for searching from the first record in table. You can set search string for each field separately. You can also use the F7 key for start search. Displays replace dialog for replacing field in records, you can set wildcard for field. Fills records in selected fields by wither constant or record number. Marks or Unmarks record as deleted. Remove current record from dbf file. Erases all records marked as deleted. Allows you pack only memo file.